The Braund Reunion continued today with a visit to East Shallowford Farm on Dartmoor. Some of us have to work though so I morphed into Mistress Agnes and chatted about The Battle of Torrington and various herbal cures. Its been very hot again so I was advising the use of deodorant. Rocket lettuce is the solution but before you all rub your salad under your arms – it is the seeds you need – just drop them in your ale. Pleased to be able to take the Braund Reunion party back to the farms where the Braunds are first recorded. Saw the outside of Keneland, Black Torrington – home of William Braund in 1525 and then once again enjoyed the hospitality of the owners of Braundsworthy Farm, leased by the Braunds in 1565. Couldn’t get the full impact of Black Torrington Church because of the art exhibition but here we are outside. First day of the 11 day Braund reunion. Lovely time on the trail of the Hartland Braunds. 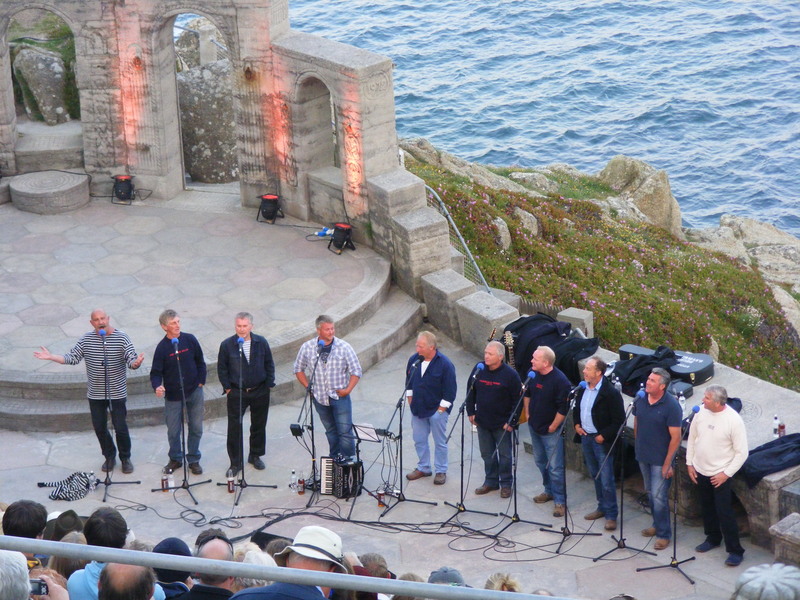 Sneaking time off in Cornwall to see the amazing Fisherman’s Friends @fishy_friends at the equally amazing Minack Theatre together with our advance party from Australia for the Braund Reunion. The support act – young bluegrass band ‘Flats and Sharps’ were very good too. 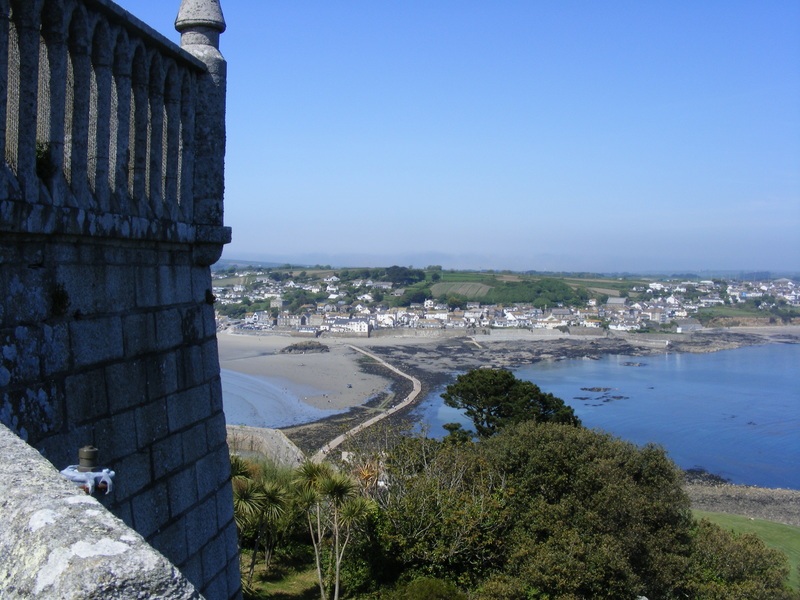 Ok, so we left 2 of our party behind on St. Michael’s Mount as the tide covered the causeway but no fire engines required this time. Well our Australian visitors (not named to protect the guilty) have already caused the fire brigade to arrive on Morrisons petrol forecourt and caused the garage to close! I am taking a 10 minute break from my stint in the C17th then off to the Minack to see Fishermans’ Friends tomorrow – hurray! Didn’t get the badges laminated last night as was embroiled in some research for a client. Woman has 5 completely different surnames but only marries twice! Mother and grandmother aren’t much better. So today, preparing my final talk for the Braund reunion then a badge making fest – did cheat and sit in the sun for this. Followed this up by assembling reunion booklets and bags and putting June issues of the Braund journal in envelopes. To top it all sent my first Coffers, Clysters to USA – now sold to 4 countries! 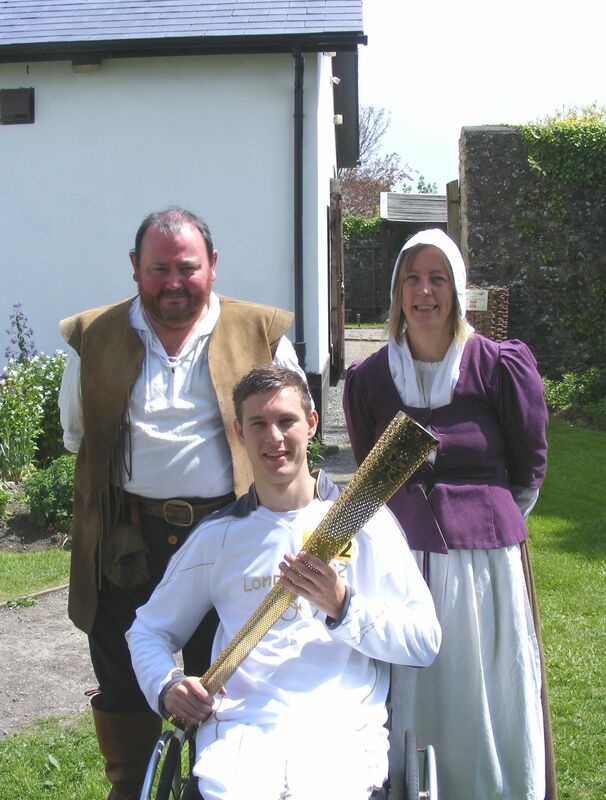 A day in the seventeenth century today and what should go by in an incongruous fashion but the Olympic torch relay. David Follitt, para- badminton player then celebrated in the cafe @ 1646 so I was able to hold an Olympic torch – they are quite heavy. Also had my photo taken – sadly not sensible enough to think of combining the two. Laminator has arrived so badge laminating for the Braund reunion tonight.